A great biography for kids about John Muir with beautiful illustrations by Thomas Locker. Another story that is obviously well crafted by Thomas Locker. As ever, his paintings are museum worthy. He kind of exists on his own level when it comes to children's book illustrations. Sure, there are the Bagram Ibatoullines and Wendall Minors out there as well, but Locker's work seems to be on par with that of Thomas Kincade as nature scenes go. You almost want to walk into the page and go for a leisurely stroll. He's really an incredible artist. The writing is always pretty good, but the artwork is just so beautiful it raises the level of the writing all around it. The paintings illustrating this title are lovely, but I felt like this was a mood piece with not as much info about Muir as I would have liked. While there was mention of Muir having a huge influence on various people who took up of cause of preservation, there was no text about his relationship with Teddy Roosevelt even though Roosevelt is depicted in the painting. Overall this title lacked substance and was not a balance between text and illustration. Locker's illustrations are lovely, but not as stunning as Stanley Fellows's. In this book the text is on pages with brown and dark green backgrounds, the illustrations only on facing pages, so the overall effect is—while appropriate—much darker and more muted, and I prefer the other. I really did like the quotes from Muir's journals, though. He had beautiful things to say about the wonders of nature. 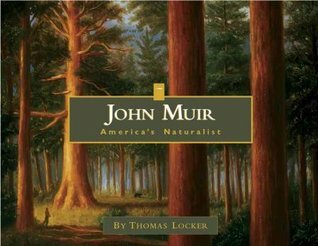 Thomas Locker's JOHN MUIR is a beautiful first introduction to the life and works of John Muir.The book can stand alone as a book of art, yet the graphics of the print, white print on colored pages facing Locker's artwork is alluring. Each page of print compliments the artwork it faces.I suggest the pairing of Thomas Locker's JOHN MUIR and John Muir's STICKEEN: THE STORY OF A DOG for young people on your gift list. If you are a John Muir fan, give this book a look for your own library. A picture book biography of naturalist and preservationist, John Muir.The best thing about this book were the amazing illustrations. They are gorgeous and do a fantastic job of capturing the beauty of Yosemite. There are quotes from Muir’s writings scattered throughout the book, as well as further information and a timeline in the back. A nice, simple introduction to Muir that is a feast for the eyes. This is a great book if you are interested in Yosemite. I think this book shows just how important this piece of our country was to John. When reading this book I could feel the passion that John had for the wilderness. I would take my students on a nature walk and tell them to look for different things in nature so they could draw pictures. I like reading this to my kids. A little above their reading and comprehension level but it has good pictures. They never pick it out themselves and is not one of their favorites but I think it is important to try to embrace nature as did John. The layout of the book includes a few facts on a page with a direct quotation to the side accompanied by a full page illustration. This book demonstrates his impact on preserving nature. Any fool can destroy trees. The cannot run away.Everybody need beauty as well as bread.both quotes by Muir.